South East Governors Forum in collaboration with Ohaneze Ndigbo and a few others based in Lagos/Abuja, worked hand-in-hand with Fulani caliphate to plot the assassination of Nnamdi Kanu and his parents. This is a fact! 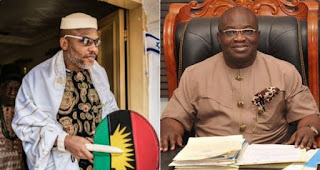 Okezie Ikpeazu thinks that a few weasel words and paltry 2 Million Naira shared amongst impoverished hungry people presented to him at the Banquel Hall of Abia State government house, will eradicate the sacrilegious invasion of the home of an Igbo traditional ruler.